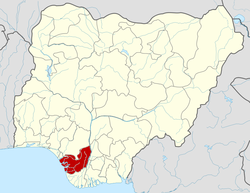 Delta State is a state in Nigeria, comprising mainly Igbo (Anioma people), Urhobo,Isoko,Ijaw and Itsekiri. The whole ethnic-groups that comprise the Delta are administratively grouped into three senatorial districts namely Delta North, Delta South and Delta Central for easy administrative purposes. Delta is an oil producing state of Nigeria situated in the region known as the Niger Delta, South-South Geo-political zone with a population of 4098291 (Males: 2674306 Females: 2024085 (see Federal Republic of Nigeria, Official gazette, No. 24, vol. 94, 2007.) Ngozi Okonjo-Iweala, the former Federal Minister of Finance and World Bank Managing Director is from this state. The capital city is Asaba located at the northern end of the state with an estimated area of 762 km2,while Warri is economic nerve of the state and also the most populated located in the southern end of the state. The state has a total land area of 16,842 km2. The state borders Edo State, Ondo State , Imo State, Rivers State, Anambra State and Bayelsa State. In the south west and south it has approximately 122 kilometres of coastline bounded by the Bight of Benin on the Atlantic ocean. Delta State was carved out of the former Bendel State in 1991. The state was created following agitations for the creation of separate distinct states by the Urhobos and Anioma regions. The then Military President, Gen Ibrahim Babangida (Rtd) created the state using the name "Delta" advanced by Niger Delta region as "Asaba" another name advanced by the people of Anioma for the capital of the proposed "Anioma state." Delta state was once integrated in the Mid Western state from 1963 to 1976 and later Bendel state, from 1976 to 1991. The name "Bendel" (Ben-Del) meant Benin-Delta to reflect the integration of Benin and Delta provinces. Delta State is ethnically diverse with peoples and numerous languages spoken in the state. The Delta North is Igbo region, the Delta Central and Delta South is made up of Urhobo, Ijaw, Isoko, and Itsekiri. These groups are known to inter-marry. Most inhabitants of the state practice Christianity and very few traditional faiths. Emmanuel Uduaghan, a member of the People's Democratic Party, was elected Governor and chief executive of Delta State in April 2007 and removed due to irregularities in the election process on the 9th of November 2010 from a court ruling. The Acting Governor is the current speaker of the house of assembly of the state, Prince Sam Obi. Rosaline Bozimo was appointed Chief Justice in April 2003. The State has three National Senatorial districts (South, North and Central). In 2007 the elected senators were James Manager, Patrick Osakwe and Adego Erhiawarie Eferakeya. There are various solid mineral deposits within state - industrial clay, silica, lignite, kaolin, tar sand, decorative rocks,limestone, etc. These are raw materials for industries such as brick making, ceramics, bottle manufacturing, glass manufacturing, chemical/insulators production, chalk manufacturing and sanitary wares, decorative stone cutting and quarrying. Delta State is known to have produced several sportsmen and women of great stature, many of whom have captained the national football teams of the nation at different times notably Stephen Okechukwu Keshi, Sunday Olise, Austin Jay Jay Okocha,Wilson Oruma,Duke udi,Sodje Efetobore,Victor Ikpeba,Jonathan Akpoborire,Nduka Ugbade, Peter Nnalue etc. Team Delta are the current winners of the National Sports Festival tagged "KADA 2009" held in Kaduna State, Nigeria with 108 Gold and a number of Silver and Bronze medals.